Derek Koester is shown receiving the Northmont Rotary Student of the Month award from Mrs. Sheree Coffman, Northmont Student Assistance Counselor. 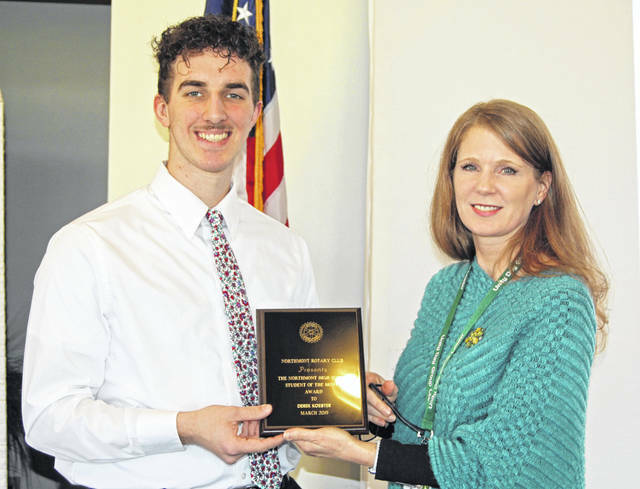 CLAYTON — Derek Koester was recently honored as the Northmont Rotary Student of the Month. A senior at Northmont High School, he is significantly involved in the school community and makes it a priority to serve others. Through Northmont Peer Facilitation Program, Koester has developed peer support skills in addition to mentoring and teaching. As a recognized role model, he has also participated in Aspirations, (a school climate committee), SADD (Students Against Destructive Decisions), Community Table, Homecoming Committee, and Habitat for Humanity. He has participated in baseball and volleyball. While doing all of this, he has maintained a 4.092 GPA, worked various seasonal and part-time jobs, and made it a priority to mentor a student from one of the elementary schools. In writing a letter of support for him, one of his teachers commented that he “is a dedicated athlete who displays as much character on the field as off the field,” has achieved Best of the Bolts every year, and is a member of the Northmont Honor Society.